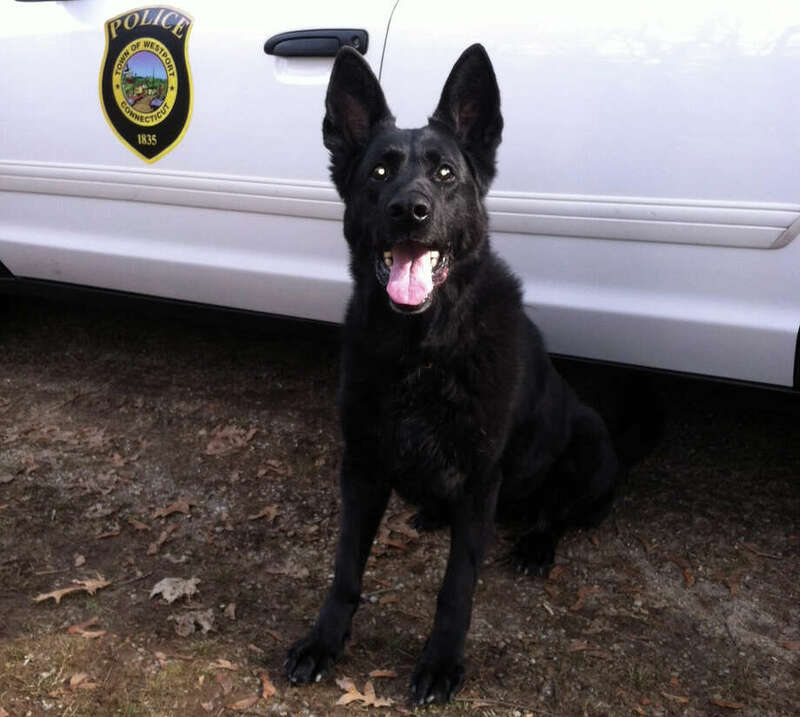 Lola, a black German shepherd who has been a K-9 officer with Westport police for 10 years, is retiring from active duty, police officials announced Friday. After a decade of dogged service on the local law-enforcement beat, Lola, the Westport police K-9, has retired. The black German shepherd, trained in patrol work, tracking and narcotics detection, is credited by police with helping her human officers make more than 1,000 collars. Lola joined the Police Department in 2002 and initially was paired with then-Officer Foti Koskinas, who is now deputy chief. In 2007, Officer Marc Heinmiller took over as handler and caretaker until Lola's retirement. She will retire as a pet with Heinmiller's family. In addition to her crime-fighting record, Lola was a goodwill ambassador for police, greeting the town's children at school events, such as the fifth-grade DARE program, as well as staging public demonstrations of her skills. As police officials make plans to acquire a replacement for Lola, local children are being invited to submit names for the new K-9. - In 2003, Lola assisted Fairfield police in locating a suicidal male in the Lake Mohegan area. - A year later, the K-9 found a burglary suspect who had broken the windows to a residence and then fled on foot. He was located by Lola hiding in the back seat of an unlocked vehicle several streets away. - Over the years, she helped police in seizing thousands of dollars in cash and vehicles linked to illegal drug trafficking. In a recent instance, $3,200 was seized as local police assisted state troopers in a drug search during a motor vehicle stop. With Lola's retirement, police officials say they hope to acquire a new K-9 soon. The local police K-9 unit is funded primarily by community donations. - Dr. Joan Poster of Poster Animal Hospital, who has provided all medical care, medications and care for Westport police dogs at no charge. She works with others, including Bill Mitchell from Mitchells of Westport, to cover food costs for the dogs as well, officials said. - Joy Dunlop from the Hazel-Dell Foundation had been a longtime supporter of the K-9 unit until her recent death, with donations for equipment and training. - John Mancinelli from Earth Animal of Westport spearheaded fundraising for the program this year. Costs associated with acquiring a new police dog can be nearly $10,000, police officials said, and they are asking the public's help in meeting that goal as they look for prospective K-9 candidates. And the town's children can play a role in selecting a name for the new police dog. Drop boxes will be placed at Earth Animal, 606 Post Road East, and the Westport Police Department lobby, 50 Jesup Road. Entries should include one male name and one female name, depending on the animal acquired. The winner will have his/her picture taken with the new K-9 and framed. In addition, a copy of the photo will be hung at police headquarters. For more information about the Westport Police Department's K-9 unit, check www.westportct.gov, and visit "Specialized Units" on the Police Department page. To support the K-9 unit, send donations to: Westport Police K-9 Unit, 50 Jesup Road, Westport, CT 06880.